As a lad, I saved up some money and visited a local and quite remarkable used bookstore. It was in the RPG section that I noticed several small yellow stapled booklets with intriguing artwork on the covers. I only had enough lawn-mowing money for three. So, I bought the first, second, and third of what I would later understand to be the Arduin Grimoires. At the time I was only truly familiar with the most rudimentary basics of D&D as provided by the Holmes Blue Book. I wasn’t quite sure what to make of these new and strange booklets, which seemed to be inherently similar to the D&D I was familiar with, but chock full of completely different terminology and new exotic flavors. Since complete compatibility between this new information and the ruleset I was already using would have been a daunting task for someone at my tender age, I did whatever any sane young DM would: I started cherry picking things that I found useful and/or interesting to me. My players positively loved rolling on this for new characters and old. Even going so far as to roll on it for NPCs they encountered. Something about the level of additional, occasionally gonzo detail this added really seemed to resonate with them. Even I still have fond memories of the 1st level Bald Magic-User with No belly button and Cyan eyes, that we unanimously decided must have been some kind of vat-created homunculus, or how matching Tree birthmarks made an Elf and Human character implausible “siblings” in a way that would take nearly an entire campaign to flesh out. I think about this table from time to time. 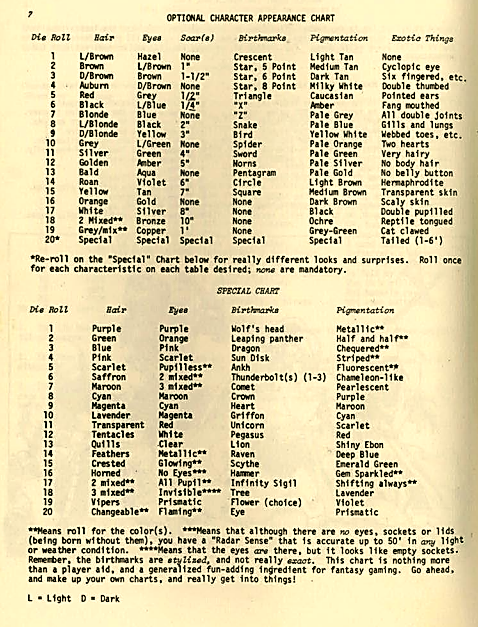 Nowadays, things like eye-color/hair-color and pigmentation are largely left up to the choice of the players, with some more modern PbtA games like Dungeon World going as far as providing a few choices in playbooks for the character’s mien and appearance. Carcosa offers players the option of choosing one of the unfortunately difficult to randomize 13 pigmentations. I think I’ll bring back the Arduin OPTIONAL CHARACTER APPEARANCE CHART. What’s a few extra d20 rolls during character creation? Maybe I’ll even allow direct rolls on the SPECIAL CHART for what players tend to consider as “Hopeless” characters. Heck, I might even keep it handy on my screen. The results of d20 attack rolls could easily be used to give opponents that one thing that makes them stand-out/memorable. “I’m going to swing my sword again at the Silver Eyed Goblin” etc. This post would be remiss if it didn’t also address one of Arduin’s more terrible tables from the same volume: pg. 4’s FEMALE ATTRIBUTES CHART. To me, it’s a silly vestigial remnant of a thankfully different time, and never really saw any use at my tables. Even now, I tend to point to it as an example of how unpleasant and unnecessarily repellent the hobby could be in it’s nascency. here is a saying that only The Strong survive, but The Stalwart is a specialist at enduring challenges. Although some problems can be solved more handily by other methods and Classes, The Stalwart is more focused on simply surviving adversity. There will always be more obstacles and challenges to face, and it is better to live to fight another day. Stalwart Characters prefer heavier armor types and are adept at donning it efficiently. All Armor types and Shields weights are halved. Some of The Stalwart’s abilities (see below) are less effective when wearing light (less than Chain), no armor, or when not employing a Shield. This Class receives the same benefits to HP based on high Constitution as The Strong (+1 HP per HD for a Constitution above 13, +2 above 16). Excelling at sustaining and surviving damage, should a Stalwart exercise the Special Combat Option of attempting a Constitution or ST to reduce damage by d6 on a success the damage is completely negated. On a failure, they are still reduced by d6, and instead of being knocked out for two rounds, The Stalwart is only stunned and may take no offensive action on their next turn. Whenever an attack would reduce a Stalwart Character’s HP to 0 or below, the Stalwart may instead opt to destroy their Shield or Armor and remain at 1 HP. This option may be exercised only once per combat. None Shall Pass – By forgoing any movement on their turn, The Stalwart becomes largely immovable. They receive double-positive rolls on all task rolls/ST associated with avoiding being tripped, shoved, or knocked down. While in this state, they may choose to receive either a +1 AV and +1 Damage or +1 AC. Hewn from Stone – The Stalwart picks a type of damaging effect (fire, acid, cold, etcetera), all damage from this damage type is halved with a successful ST. Changing the damage type is possible, but only after the character succeeds a ST against the new type of damage and receives a good night’s rest. Pack Mule – For the purposes of determining the impact encumbrance and carried weight has on The Stalwart’s Movement Rate (cf: pg 16) is always treated as one category better. The character also receives double-positive rolls on Strength rolls to strain. Shrug it off – Once per combat, The Stalwart may immediately heal double-positive 1d6 HP on their turn with a surge of adrenaline or second-wind. Their natural healing rate also doubles. Armor Bonded – The Stalwart may sleep and rest in full armor with no penalties. They receive a +1 bonus to AC if wearing armor heavier than Leather. Always on the look out for new and better protection, The Stalwart receives double-positive rolls in identifying, repairing, or haggling for Armor. Still Kicking – If reduced to negative HP, The Stalwart can opt to continue to remain active and mobile for up to 2 rounds per HD before collapsing and succumbing to the normal rules. Further damage necessitates a ST to remain conscious. When this ability is used, if The Stalwart survives, they must write the Disadvantage “Marked by Death” next to one of their attributes, and this can be evoked for negative-double rolls by the Referee. This disadvantage persists until the character gains a level, and a Stalwart may not be “Marked by Death” more than thrice. Sticks and Stones – If missed by a Melee attack from a normal weapon, once per battle a Stalwart can choose instead to take 1d6 damage and the weapon will be broken and unusable. If The Stalwart is wearing less than Chain or does not possess a Shield this damage is double-positive. Shield Master – Any shield used by The Stalwart is doubled in effectiveness (+2 AC), even without a shield, The Stalwart can use improvised objects (tables, chairs, even a secondary adjacent foe) to block attacks and receive a +1 AC). If they forsake their movement, this ability also grants a free attack in the form of a Shield Bash doing d6 damage. Should the bash do maximum damage (6), the shield is damaged or dented and loses effectiveness (-1 AC). Characters with The Stalwart Class can use any weapon suitable to their Vocation and are also trained to know how to retreat when the tide of battle turns. They do not solicit free attacks when disengaging from combat, even if they turn and move at full speed. lthough traditional Reaction Rolls are eschewed in WHITEHACK (instead supplanted by a Charisma task roll), there is still an opportunity for a Character Class Archetype that overcomes traditional challenges by a new, more socially-centric means. Shunning the direct physical or metaphysical application of force utilized by The Strong and The Wise and instead adopting a completely different angle of approach, Players can utilize The Charming Class to attempt to surmount obstacles without the need for bloodshed or evoking the supernatural. Characters with The Charming Class are seldom well-armed, but often disarming. Either via showcasing sincere empathy and kind-heartedness, carrying out a crafty con or diabolic deception (more typically, the subconscious blurring of multiple routes), the primary tactic of a Charming character is to develop common ground with an impediment that can be socially engineered and use this bond to arrange for favorable conclusions. This common ground/bond is represented by sharing an Affiliation Group. When a Charming character has an Affiliation in common with a particular obstacle (usually people, but could also be places, organizations, even things, etcetera) all Charisma task rolls when interacting with the obstacle in order to influence Reaction are double-positive. Unlike other Classes where Affiliation Groups are relatively static and only swapped or newly acquired through play, a Charming character may use their Slots as a temporary stand-in. These “Slot Affiliations” are more superficial and finite than the standard Affiliations acquired through play or level dependent increases, but they are versatile: When first gained, a d6 should be rolled and the value noted. This value represents the number of times the Affiliation Group can be utilized for task rolls (this includes Charisma task rolls for Reaction). In contrast to standard Affiliations, Slot Affiliations are not associated with a specific attribute (much like The Deft’s Vocation) and can be utilized for double-positive task rolls on any attribute. Each time this is used, reduce the Slot Affiliation value by 1. When the Slot Affiliation value reaches 0, it becomes “inactive” and cannot be used for further task rolls until refreshed. In order to refresh or gain a new a Slot Affiliation The Charming Character must seek out or encounter a member of the Affiliation Group, and after receiving a positive Reaction, spend at least an hour or so conversing/interacting with the individual. After this socialization is complete, a d6 is rolled once more and recorded for a new Affiliation value. Additional options are provided below in the Section entitled Social Combat. A Slot Affiliation can represent a mostly superficial, but still useful amount of knowledge concerning the Affiliation Group. Either enough information to successfully impersonate for the purpose of convincing a real member that you share membership, or perhaps a sufficient general understanding of the Affiliation’s cultural cues and social mores. The Charming character must be careful however, for many Affiliations do not take kindly to this intrusion, and if found to not possess a genuine relationship or connection with the Group, it may preclude them from using their Slot for this Group in the future as word within Affiliation Groups can travel quite fast. Characters with The Charming Class may use any weapon or amour befitting their Vocation without penalty but must take care that their raiment and mien are suitable and compatible with any active Slot Affiliations. Attempting to work their charms within the Tower Wizard’s College in Full plate is bound to draw suspicions in the least, or reduce their Slot Affiliation value by d6 at worst. Should the Slot Affiliation value ever go negative, word has spread of The Charming as an imposter in the ranks, and this Affiliation Group is no longer available as a Slot Affiliation. However, it can be regained as a Level-based Group through play and extraordinary reparations. To refresh or gain a new Slot Affiliation Group or add a new Affiliation, a Charming character must best a member of the Affiliation Group in question in Social Combat. This is designed to emulate sly inveigling, genuine interest, or other conversational means of confidence. In many ways this is remarkably similar to the Melee combat resolution process: Task Rolls are made against the target’s Social Armor Class, and must exceed it, while still being successful (under the attacker’s AV). Fortunately, The Charming character will usually take the first turn, and as with The Strong, a character with a Charisma attribute of 12+ receives a +1 to their Social AV. A Charisma attribute of 16+ engenders a +1 to Social Damage (base Social Damage is equal to the Charming character’s HD, sans modifiers). Violence or open hostility, as well as established patterns of wrong-doing/negative influence typically engender negative-double rolls or may be foredoomed to failure at the Referee’s discretion. The above are merely suggestions for only the most common of social situations. For Monsters and such of formidable power, additional modifications may be necessary. Standard AC can occasionally also serve as a baseline here. In terms of timekeeping, Social Combat rounds are usually longer than their Melee counterparts (closer to the traditional RPG “Turn,” or 10 minutes) reflecting the amount of time it takes to successfully converse and interact. On a successful Social Attack, damage is subtracted from a target’s HD or Level (higher as applicable). It is important to note that a failed Social Attack leaves the Charming character vulnerable to a free counterattack or Social Riposte by the target however (AV 10+HD), and the Charming’s Base Social AC should be treated as 1 (one must let their guard down to produce at even the semblance of sincerity). When a participant’s Social Damage total exceeds or meets their HD or level, Social Combat ends. If victorious, The Charming may use one of the targets Affiliation Groups as their Slot Affiliation, or “refresh” an existing one by adding d6 to its current value. A new Reaction Roll (double-positive on Charisma, with a newly shared Affiliation Group) can then be attempted to further adjudicate the situation. If defeated, further Social Overtures on this target will be negative-double, and if already present, the Slot Affiliation value is reduced by d6 until it can be reacquired from a different target. As above the Slot Affiliation value ever go negative, word has spread of The Charming as an imposter in the ranks, and this Affiliation Group is no longer available to the character as a Slot Affiliation. However, it can be regained as a Level-based Group through play and extraordinary reparations.